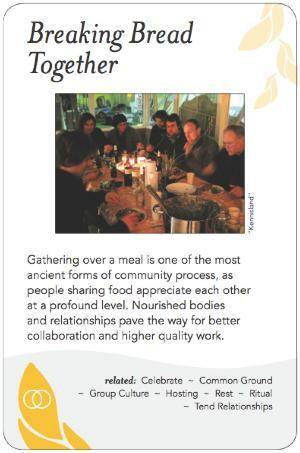 Gathering over a meal is one of the most ancient forms of community process, as people sharing food appreciate each other at a profound level. Nourished bodies and relationships pave the way for better collaboration and higher quality work. By meeting our core biological needs, feeding people creates a container for work at a deep level. When we relate simply as people, judgments and niggly issues can be dropped about "the other." Sometimes this is called primate food-sharing behavior, because of the deep biological roots this has in signaling group belonging and familiarity. It means you have relaxed enough to put your (physical or rhetorical) weapons down and trust each other. Eating with someone starts to make them a friend and not just a colleague. This particular pattern is cross-cultural, as everyone everywhere eats. Food may be created by the participants themselves (as in a potluck) or by others who cater. It may be short (just a snack or coffee break), or a full meal together. A full meal may be served buffet-style, or on plates at tables. People may remain seated in one place for the duration of the eating together, or circulate around the room. Seats may be assigned or chosen. There may be one shared conversation at the meal with people taking turns speaking, or there may be many separate conversations happening in parallel. Which of these happens is largely dependent on culture: for example, potlucks at alternative culture occasions vs.catering at corporate events; lots of people talking simultaneously at Jewish meals vs. one person speaking at a time at WASPy meals; short snacks or "grazing" at techie events vs. long sit-down meals at academic conferences; and so on. Cooking together as well as eating together can be part of the process at some events. Each of these choices affect social dynamics and who ends up in conversations with who and for how long. If you are in a conference with concurrent sessions, lunch can be a wonderful opportunity to cross-pollinate among sessions. People bringing food for potluck are also sharing a bit of themselves with the group. Some events have particular rituals related to food, such as the raising of glasses in a toast, or including an awards ceremony over a fancy meal at an organization's annual meeting. Eating Together is often invoked at the opening or close of an event; in the latter case it may serve as a culmination or celebration of the work accomplished. It could be as simple as sitting around a campfire toasting hot dogs and s'mores. If the meeting or session is intense or emotionally charged, a meal break can serve as an important time to let off steam, relax, or recharge. In these cases it is usually better to allow multiple, informal conversations and circulation at the meal. Event organizers sometimes sacrifice this pattern when time, money, or space run short, but in doing so they miss a key opportunity to foster group cohesion. It is important to be aware of participants' "food issues" and how to accommodate them. If the goal of Eating Together is to increase a sense of belonging, then you don't want to undermine that by not having options available to feed vegans or people allergic to wheat gluten or whoever else is attending your event. Making sure that everyone can be fed helps people feel loved and cared for, and therefore more likely to give energy back to the group or cause. It may also be important to include healthy snacks in order to support everyone operating at their best physical attention. Trying to conduct a formal meeting over a meal is usually a bad idea. The group won't focus well on the business, nor enjoy the food--meals should be primarily social, even if business is conducted informally in smaller conversations while people are eating. Having snacks available while a formal session is in progress is different, because a few people accessing snacks doesn't call for the same level of focus as a full meal. If you are using processes that need to run to a natural conclusion without interruption, be wary of scheduling firm meal start times.